Social events at Broadstairs SC are a very important and integral aspect of the Clubs annual calendar. There is normally at least one social event each month during the year and posters advertising the events are displayed in the clubhouse along with signing up sheets for catered events. This information is also communicated to members by e-mail and listed within EVENTS. Events include the annual dinner & dance, AGM & prize giving, informal themed suppers, quizzes, entertainment evenings and specific events for junior members and families. In addition, hot meals are available following sailing on Thursday evenings and Sunday lunchtimes. 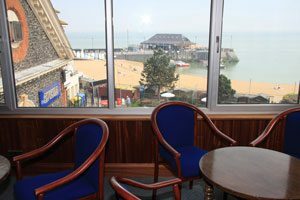 Views over Viking Bay from the clubhouse All events are organised by the social committee and members with an interest in this aspect of the Club are encouraged to help in any way they can. The Club house is available for hire to Club members or relatives / friends of members. If interested please speak with a committee member. The Club Hire booking form can be downloaded via the members area.